The Tánaiste has defended the Labour Party’s record in government and said that Joan Burton is doing a “fabulous job”. 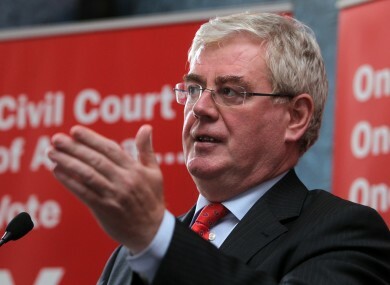 TÁNAISTE EAMON GILMORE believes the Irish people will not reward “the party that caused the crisis and punish the party that solved it” as he acknowledged that Labour is suffering in the opinion polls. Speaking ahead of the parliamentary party’s annual think-in in Meath today, the Labour leader defended his party’s decisions in government and claimed that 30,000 new jobs have been created in the past year alone. “We were never under any doubt but that the job of work that we took on two-and-a-half years ago was difficult and that it was going to be challenging and it has proved to be that,” he told RTÉ’s Morning Ireland. He said he would not deny that he takes heed of the opinion polls – which show Labour at a five-year low – but said “we cannot be dictated by short-term decision making”. Gilmore criticised the previous policies of Fianna Fáil finance minister Charlie McCreevy and expressed confidence in his party’s ability to recover at the polls. “I believe that at the end of the day I think that the Irish people are not going turn around in a general election and reward the party that caused the crisis (Fianna Fáil) and punish the party that solved it,” he said. He said that the country is “back on our feet but we cannot be complacent”. Gilmore hit back at claims that the party had broken election promises saying that 330,000 people had been taken out of Universal Social Charge and the cut in the minimum wage had been reversed. “In any coalition government you dont get your own way all of the time,” he said adding that when the government took office two-and-a-half years ago “there was about five months’ money left n the kitty”. He said the budget is not going to be easy but that said that the adjustment had to be done “in a balanced way, in a fair way” and said there is not a case for doing more than is needed as some have argued. “We have to do it in a way that is sensible, that ensures there is confidence restored to our economy and people can breath again,” he said. On the Seanad abolition referendum, Gilmore appeared to be open on reforming the upper house if there is a No vote but insisted that this is not the question on the ballot paper. “I believe that in a country of this size, that one parliament is sufficient,” he said insisting that abolition is not a power grab. On tensions with Labour deputy leader Joan Burton, the Tánaiste insisted that his Cabinet colleague is doing a “fabulous job” at the Department of Social Protection. “Joan Burton and I work very well together,” he added. Email “Gilmore: The Irish people aren't going to punish the party that solved the crisis ”. Feedback on “Gilmore: The Irish people aren't going to punish the party that solved the crisis ”.